Title: 'Palestina vel Terra Sancta'. Latin text to verso. A fine map of the Holy Land from Ortelius' important World Atlas "Theatrum Orbis Terrarum". The map shows all of the Holy Lands with Egypt. In the upper left is a text box describing the region. In the bottom right is a fine title cartouche with mileage scale below it. Five sailing ships and three sea monster in the ocean. 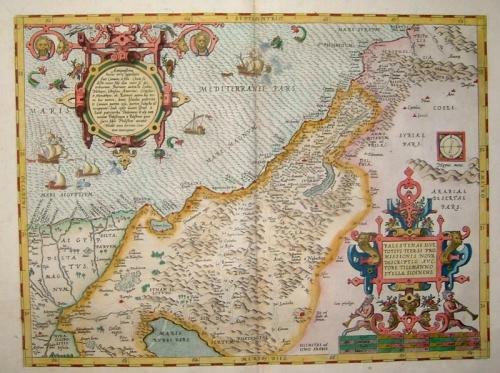 This map was followed by Ortelius' "Terra Sancta" in 1584. In very good condition with strong paper and wide borders. Ref: van den Broecke 170.